Rock Cycle Quiz Game click here. For Interactives - Dynamic Earth, click here. The representation should be something that can easily be pictured in your head. Check out the layers of the Grand Canyon and how they formed by clicking here. (PUZZLE). They would seem to fit together like puzzle pieces. MOUNTAINS. Certain mountain ranges lined up and continued from one continent to another. FOSSILS. Fossils found on the edge of two different continents separated by an ocean, would make more sense if the continents were together in the past and the organism lived only in one place (especially if the creature couldn't fly or swim). CLIMATE. Fossils of plants and animals that lived in tropical climates have been found in Antarctica. This could be explained if Antarctica had once been closer to the equator. Most people laughed at his idea because he couldn't prove how continents could move. Funny song about Alfred Wegener and continental Drift by the Amoeba People. A quick animation of the break up of Pangea, the supercontinent. The current theory about the movement of earth's crust is called Plate Tectonics. Earth's surface is broken up into large pieces called tectonic plates and these plates are always moving. The areas where one plate meets another plate are called plate boundaries. At convergent boundaries, if the land masses are both made of continental crust, then neither one is dense enough to go under the other, so they smash together and are forced upwards. This is what happened when India crashed into Eurasia, thus creating the Himalayan Mountains (and Mount Everest!) These two plates are still colliding today, forcing the Himalayas to grow just a tiny bit taller every year. 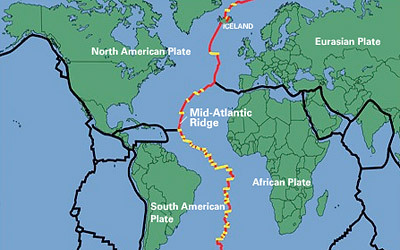 Several plates have boundaries along a line that runs down the middle of the Atlantic Ocean. This line is called the Mid-Atlantic Ridge and is a divergent plate boundary. Every year North and South America move further west while Europe/Asia and Africa move further east. As magma from under the crust rises through the crack in the Earth it cools forming new igneous rock. Because the ocean is cold this new igneous rock (basalt) cools quickly and is very dense. The current Era is the Cenozoic Era. The Mezozoic Era is known as the time of the dinosaurs. The extinction of the dinosaurs marks the end off the Mezozoic Era. During the Paleozoic Era, small creatures thrived like fish and trilobites. During the Pre-Cambrian Era, organisms were very basic, like bacteria. "Weathering breaks it down. Erosion takes it away." For billions of years, little pieces of our earth have been weathered and eroded by water. These little bits of our earth are washed downstream where they eventually settle to the bottom of the rivers, lakes, and oceans. Layer after layer of eroded earth is deposited on top of each previous layer of eroded earth. The weight of the layers above presses down on the layers underneath until the bottom layers slowly turn into rock. Soil is a thin covering of land areas on the earth’s surface. It is made up of broken up (weathered) rocks, mineral fragments, water, air, and organic material like leaves, roots, twigs, dead bugs and things like that. To explore the different layers of soil and play an interactive game (Soil Safari) click here. To play a game of Soiltris (like Tetris, but for soil) click here. Uniformitarianism (uniform-itarian-ism): processes that happen today happened in the past with the same results; "the present is the key to the past." Examples of processes: Weathering, Erosion, and Deposition. Uniform = same. Original Horizontality: sediments are deposited in horizontal layers. When rock layers appear shifted, tilted, or warped, some process or processes must have occurred AFTER the original horizontal deposition to cause the shifting, tilting, or warping. Superposition: layers of rock on top are younger than layers of rock underneath. For an interactive index fossil activity click here. Earth is made of several layers. Mantle: mostly solid and rocky. Crust: thin and brittle. We live on the crust. As far as we've gone, we've never been able to drill all the way down through the crust to the mantle. Make a model of Earth's layers that's good enough to eat! For instructions how, click here. Any rock type can be changed into any of the other rock types. Rock can even be changed from one rock to another rock of the same type!